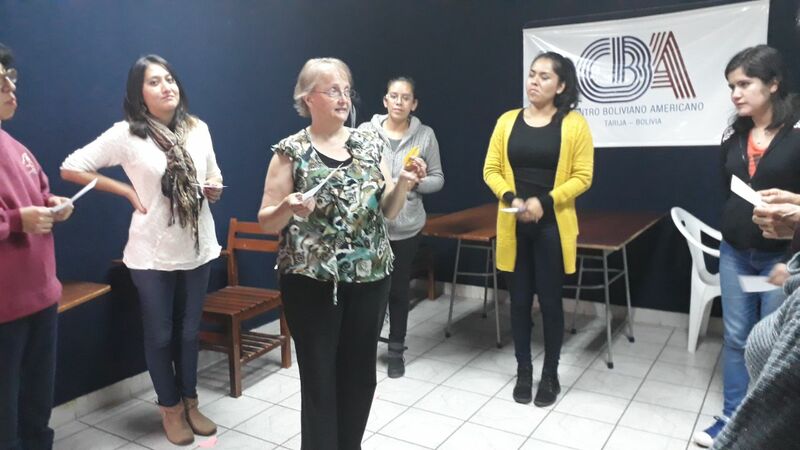 Galyen teaches a vocabulary game to teachers in Bolivia. 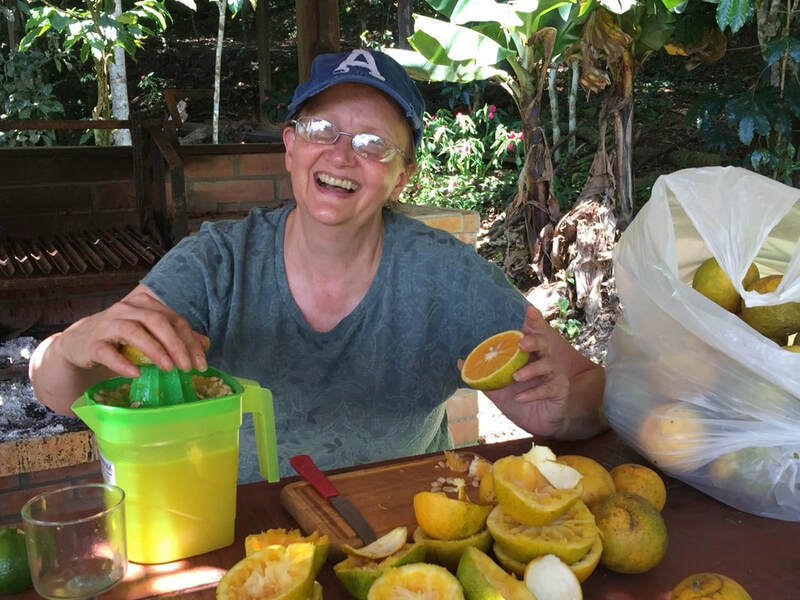 One of Galyen’s favorite experiences was picking oranges off the tree and making fresh orange juice in Bolivia. Pictured above, Galyen is viewing swords with Javier Alcoba at the Moto Mendez Museum. Southwest School’s Spanish teacher was offered a once-in-a-lifetime opportunity to travel to Bolivia through the Partners of the Americas program, and she is passing along the knowledge she gained to her students. Southwest’s Spanish teacher Dianna Galyen has taught at the school for seven years after working at private schools and as teachers’ aide before. This school year, an opportunity presented itself that Galyen said she couldn’t pass up: a trip to Bolivia to instruct other teachers how to teach English. Galyen said, “I learned about the program when Rosarsio Keel visited the school looking for students to participate in youth ambassadors program. It takes students for a month to a foreign country, and they go in groups of ten students and a mentor. It’s a fantastic program for them to be able to learn about the world farther away. From there, Galyen prepared to travel to Tarija, Bolivia, for the bulk of her stay, finishing up in La Paz, Bolivia, before coming home. She left on February 16 and stayed just under four weeks total overseas. Most importantly, Galyen said what she learned she can give back to her students. She said, “It was an opportunity of a lifetime for me. It was the only way I’d ever get to do this. It’s amazing the things I can bring back to my students. I can’t wait to plan lessons for next year. I know so much more than I did, and I can show them pictures and give them a feel for that experience. Galyen said, “Programs like this are very important. The purpose of the program is to build strong bonds between the two Americas so we can work in partnership and help each other accomplish our goals. I think that’s important especially in a world where division and the norms are sometimes not getting along and being divided. I think its important to bring people together for common goals and have people realize we have a lot in common. And we have common problems and we all have unique and different ways of finding solutions. Friendship will make our world a better place. Galyen said part of what she gained from the experience was confidence in her abilities, which will translate into her teaching. “One of the most exciting things is I learned what I can do. I learned, of course, I’m fluent and everyone understands you and you understand everyone else, and it works. Learning she could thrive in a Spanish-speaking country, but for Galyen, that wasn’t the only challenge. Her assignment was to instruct teachers, not students. She said she didn’t have much public speaking experience prior to going to Bolivia. She said, “When I found out my assignment was teaching teachers, I was a little scared. I learned big public speaking there. My main purpose was to teach foreign language teachers methods to teach foreign languages. Sometimes my classes were 12 and my largest was 44 people. “I considered it a really strenuous schedule for me. Every minute I wasn’t speaking, it felt like I was pulling it together as fast as I could do the next presentation. I was grateful for good classes at College of the Ozarks where I learned pedagogy. I had a lot of notes that I could look back on. I was also thankful for professional development offered at Southwest. It wasn’t the luxury of speaking to different people and repeating my lessons. For the most part, it was delivering workshops and then see the same people a couple times a week. When Galyen wasn’t teaching, she was learning about the culture and different aspects of Bolivian life. She said, “It was so interesting to function within the society which I’ve studied. “I teach Spanish architecture as part of our curriculum in Spanish class, and I felt I understood it very well until I’m looking around and surrounded by this very architecture: the balconies and roof tiles and the interior patios. It’s entirely different to be surrounded by it and a part of it. “I was impressed so much by the hospitality and good manners. They will speak to everyone in a cab, not just one person. At a restaurant, they greet everyone at the table. As you leave a restaurant, you say goodbye to all of those people.